Hungary’s public television channel M1 was recently fined a symbolic HUF 1 million (USD 4,000) by the National Election Committee for violating an election rule which states that parties must be given equal airtime. Moreover, the channel hadn’t even bothered reaching out to opposition politicians when it ran stories about them. The National Election Committee ordered M1 to start providing equal access to opposition parties to showcase their platforms. That said, it was especially interesting to watch M1’s broadcast Tuesday night of an interview with Jobbik spokesman Ádám Mirkóczki. “The next five minutes is Jobbik’s,” said the host, passing the camera to the stage where Mirkóczki and the interviewer were sitting. “Spokesman Ádám Mirkóczki is here with us. Good evening. Go ahead,” the interviewer said. Mirkóczki then unleashed a monologue that had absolutely nothing to do with Jobbik’s platform. Instead, he spoke uninterrupted for five minutes about how Hungary’s public media has turned into a propaganda machine meant to discredit all opposition and promote Hungary’s ruling party. 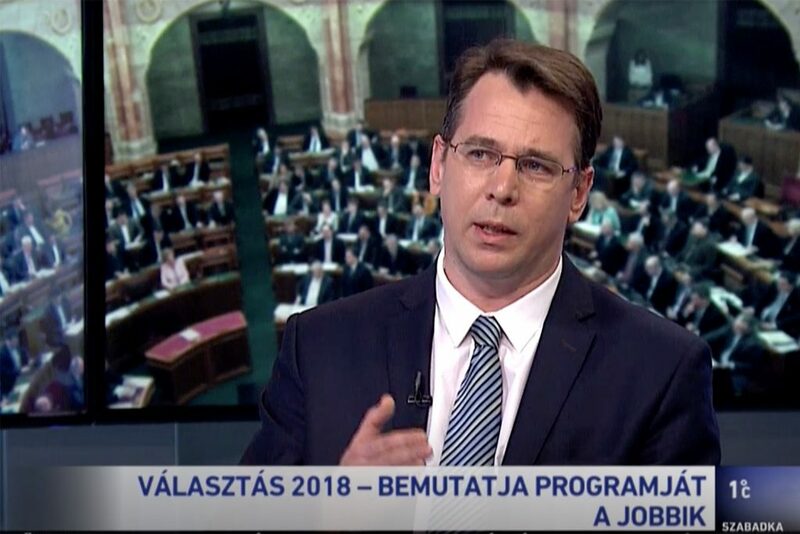 According to Mirkóczki, five minutes would not be enough to reject all the lies that public media had just recently spread about Jobbik, let alone present his party’s platform. He said it is obvious that public media carries out the orders of Fidesz. Mirkóczki also complained that in the five minutes he waited before the interview, the channel aired a character assassination report against an opposition politician ostensibly because that politician had uncovered abuses by the government. Even then, Mirkóczki said, the report didn’t give the politician the right to respond. The feeling of fear needs to end, Mirkóczki said, and journalists should be ensured the freedom to do their job according to the rules of the profession. This is what’s at stake in the April 8 general election, he added, explaining that the problem is made worse in that voters simply cannot access information that is important to them.